What is in our burgers and mince? Our burgers and mince meat comes from the same beef herds that we use for our other products. Meat from traditional British cattle breeds, from the best farms in Scotland. These animals have been free to roam in some of the most beautiful unspoiled scenery in the world, breathing the clean air and drinking water off the burns. They have fed on a mixture of grass and corn. This meat is some of the finest prime Scottish beef you can buy. Scotch beef is the choice of some of the worlds top chefs as it’s in a class of its own for taste and tenderness. All our beef has been matured for 28 days, then cut and ground by our master butchers who also may add the seasoning, herbs and spices depending what they are making. In our burgers we use the best quality chuck meat. We add no artificial preservatives, enhancers, flavourings or colourings and absolutely no fillers or bulking agents. All you get is 100% beef and the natural seasonings we have added. 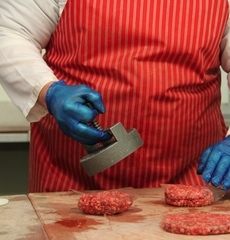 At Meat No Veg we make all our burgers and mince meat by hand, on the premises, so we can be 100% sure of all of this. What is in our sausages? The meat in our sausages come from the same pig herds that we use for our other products. These animals are reared outdoors, on small farms in the beautiful North Essex countryside, free to roam and root for food in the natural way. This is some of the finest prime pork meat you can buy. The meat, taken form the belly amongst other cuts and is then cut and ground by our master butchers who also add the seasonings, herbs, spices and other vegetables such as onion or leaks depending on what they are making. Following traditional English recipes, we use natural pig casings, and so our handmade butchers sausages are full of flavour. Our butcher’s sausages contain no artificial flavourings, enhancers, colours or preservatives and absolutely no fillers or bulking agents, we guarantee it.